InterContinental Melbourne The Rialto is offering a range of uniquely Melbourne packages for locals and visitors to make the most of this winter season. Those keen to explore Melbourne’s hidden cultural offerings will love InterContinental Melbourne The Rialto’s Insider Coffee Culture, offering guests a sensory coffee journey with a coffee connoisseur and educator. Those looking for a weekend of relaxation will enjoy Indulge Your Senses, giving visitors the opportunity to sample ingredients and create their own unique perfume fragrance. Create a memorable escape and immerse yourself in Melbourne's iconic culture. 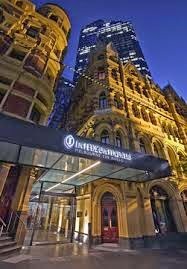 Located only a short stroll to many of Melbourne's best attractions and with easy tram access, InterContinental Melbourne The Rialto is the ideal base to explore Melbourne. Abundant with hidden laneways and shoebox-sized cafes, Melbourne proudly stands as the coffee capital of Australia. Relax in luxury overnight accommodation on Collins St at the historic InterContinental Melbourne The Rialto hotel, and wake to a full buffet breakfast for two in Alluvial Restaurant before delving into an hour long sensory coffee journey with a St Ali Family coffee connoisseur and educator. Experience the luxury of creating your own perfume at Fleurage Perfume Atelier. Embark on a personal scent discovery as you sample ingredients, discover fragrances, and create your own custom fragrance tailored to your individual personal requirements. Enjoy a lavish weekend away with luxurious overnight accommodation in a Club King Room, a stylish and spacious guest room with Nespresso coffee machine and Agraria spa products. Immerse yourself in true relaxation with a couple’s treatment at East Day Spa, where you and your partner will enjoy a luxurious 1 hour relaxation massage and 15 minute foot ritual. Enjoy your weekend in luxury as you access the exclusive Club InterContinental Lounge, with complimentary breakfast, afternoon tea and evening canapés served daily. *All rates subject to availability.